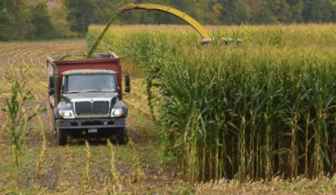 ITHACA, NY (WSKG) – New York’s Farm Bureau says even though the legislature is under Democratic control, the needs of farmers don’t change. The group, that represents New York farmers, has announced its legislative priorities. One of the greatest concerns for farmers is actually something the state doesn’t have much control over: dairy pricing. Despite that, Jeff Williams, who’s Public Policy Director for the New York Farm Bureau, said there are ways the state can help dairy farmers. One of the actions the legislature could take on behalf of farmers is to pass a law that reimburses them for unemployment premiums they pay to the state. Some farm workers can’t collect because they’re in the country on a federal H2A visa. That visa requires migrant workers to return to their home countries after their work period is over. As a result, they cannot collect unemployment benefits. The Farm Bureau also wants New York to extend tax credits that help agricultural employers cope with minimum wage increases. They also want more training that should help farmers fully understand regulations that govern the welfare of farm animals. Next month, the Farm Bureau plans to announce its federal priorities. Williams mentioned one issue sure to be on their congressional wish list. The New York Farm Bureau represents about 20,000 members.